A scooter rider was killed Saturday night in Sarasota after the unidentified male rider turned into the path of a minivan and was struck, according to the Florida Highway Patrol. The rider was headed west on Clark Road around 8:40 p.m. Troopers claim that he turned left on a red light into the path of a Dodge Caravan at the intersection with Honore Avenue. The rider was thrown from the scooter and pronounced dead at the scene. The driver of the mini-van, a 41-year-old Thonotosassa woman, was not harmed. None of the three passengers riding in the van suffered injuries either. Scooter sand mopeds have become increasingly popular within the last few years due to the rise in gas prices. While these vehicles can be quite useful in urban settings, their small size and slow speeds, which allows for high gas mileage, makes their riders even more vulnerable than motorcycle riders in the event of a collision. 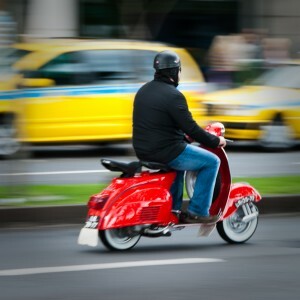 Scooter and moped accidents are frequently caused by other drivers. Sadly, the injuries sustained in these types of accidents can be long-lasting and often result in death. Fatalities in scooter or moped accidents can be quite traumatizing. A Tampa Bay Wrongful Death Attorney at Whittel & Melton can help you deal with the aftermath of losing a loved one by taking action through a wrongful death lawsuit. We represent victims of moped or scooter accidents as well as family members of those killed in these accidents throughout Hillsborough, Pinellas, Manatee and Sarasota Counties, including Tampa, Brandon, St. Petersburg, Clearwater, Bradenton and Sarasota. To learn more about how we can help you get through this difficult time, please call us today statewide and toll-free at 866-608-5529 or fill out an online evaluation form by downloading our free app from the Apple App Store or get it on Google Play.